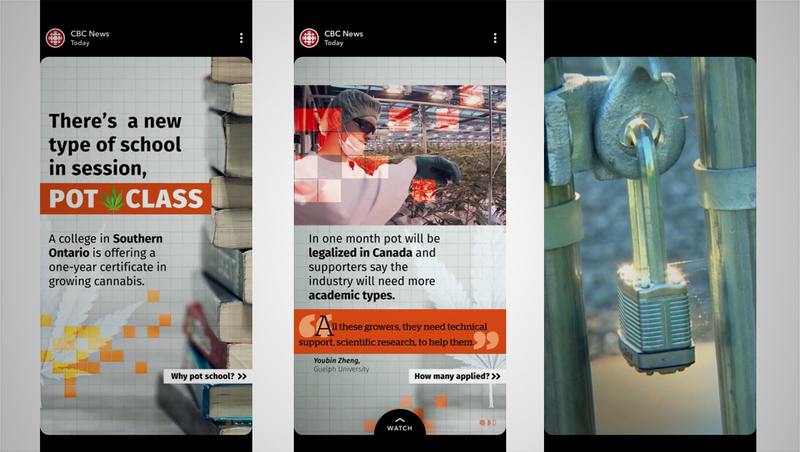 In addition to launching a kids news website, the CBC has also jumped on the Snapchat bandwagon. The network began posting exclusive interactive content to the Snapchat Discover section of the platform Sept. 5, 2018. Instead of posting short “newscasts” like NBC News’ “Stay Tuned,” the CBC’s strategy involves posting a few stories per weekday that feature a mix of relatively simple motion graphic “slides” complemented with video clips. Recent topics have included a Canadian college offering a marijuana class, the artist behind the first all-transgender record label and a segment that tackles the debate of vaping. So far, the segments include orange accents and square, grid background elements. The segments, since they are on the “Discover” part of Snapchat, do not expire, and also include advertising. CBC and Snap have struck a revenue sharing deal, reports The Hollywood Reporter. Later this fall, CBC will also launch culture and entertainment editions once per week on the Snapchat Discover platform, covering pop culture, lifestyle, health and more.